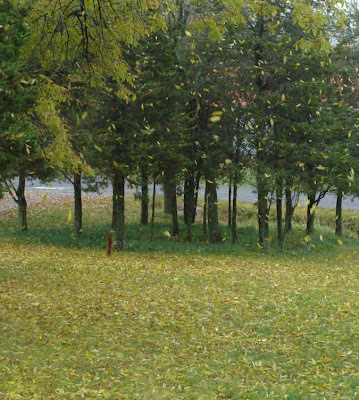 The leaves are falling so fast from the ash trees that it looks like a snowstorm. I really need to get out there and start raking them up. The leaves I put into the leaf store I made last year decomposed beautifully and have now been put around the asparagus plants as a mulch, freeing up the container for this year's supply. First, however, I had to make Hallowe'en treats for the school bash tomorrow. This task has been complicated by the need to make the treats relevant to my daughter's recent project on Canada's trading partners (exciting, eh?). Her chosen (or allocated, not sure which) country was China, so we spent some time the other night doing internet research to try and work out whether there was a Chinese treat that we could easily make and that would keep for 24 hours. 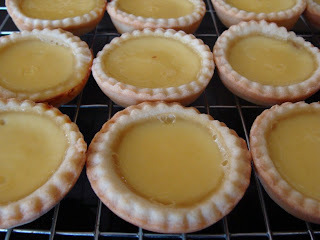 To my surprise, it turns out that egg tarts ('custard tarts' in Britain) have become a traditional Chinese treat. In Chinese they are known as Dan Tat (蛋撻). I found a straight-forward-looking recipe and got baking. They are usually served hot, but I hope the children at the kids' school won't be aware of that! I love custard tarts. My love of cold custard causes shudders when I mention it. I never would have imagined they would catch on in China.